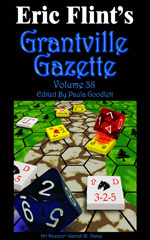 Once again, the Grantville Gazette is ready for your reading pleasure. Robert E. Waters, a new author for us, presents "The Game of War," in which you'll experience an area that hasn't been explored by our other authors. Bradley H. Sinor and Tracy S. Morris are back with "The Play's the Thing," with intrepid reporter Betsy Springer and her sidekick (although he'd hate that description ) Denis Semsa and a surprise guest. Kerryn Offord gives up "Paper Mate," a love story by any description. Gorg Huff and Paula Goodlett are exploring technology, but what happens to "The Arrow" and why? It's easy to find out. Eastern Poland is experiencing its own problems, which you can read about in Kevin and Karen Evans' "Mitzi the Kid." And, oh, those up-timers have some strange ways. Check out Jack Carroll's "The Lesser of the Two Evils" to find out about them. Herbert Sakalaucks is back, this time with "Aerial Donkeys," and no, that doesn't mean the donkey's have sprouted wings. Tim Roesch brings us more up-timer oddities in "Letters Home, 1 and 2," a new serial written from a down-time perspective. Bird Lady Pam is still off trying to save the dodo in "Second Chance Bird, Episode Seven" from our art director and author Garrett W. Vance. Nonfiction covers a lot this issue. Brad Banner tells us about tuberculosis in "The White Plague," and Iver P. Cooper tells us how they might develop treatment for it in "The New Royal Touch: Synthesis of Anti-TB Drugs." Iver also explains how hydrogen, for the airships might be produced in "Hydrogen: The Gas of Levity." In the Universe Annex, Gary Cuba offers "For the Love of Sin," a wonderful story all about, well, sins. You'll enjoy it, we're sure. Bud Webster tells us about one of the great science fiction authors, Clifford Simak, in his Past Masters column, and Kristine Kathryn Rusch is getting a bit of TMI in Notes From the Buffer Zone. Join us for our November 2011 issue, number 38 in the ongoing saga of what's happening in Early Modern Europe.